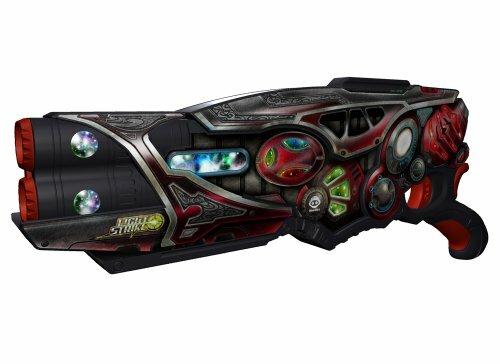 The WowWee Light Strike laser tag gun range comes in two versions: the Assault Striker and the Striker. The latter is basically a laser tag pistol, while the WowWee Light Strike Assault Striker is designed in the shape of an assault rifle. Both guns are awesome laser tag toys, but in the this review we’ll be having a closer look at the Light Strike Assault Striker. The Assault Striker comes in 3 different colors with each version having a slightly different look-and-feel. This is great as it gives each color its own identity. Apart from the different look, the 3 versions – red, yellow and orange – are technically the same laser tag guns. They’re just wearing different jackets which is cool because it makes them all a bit unique. The design of the Assault Striker is very similar to WowWee’s Paper Jamz range. If you’re not familiar with Paper Jamz, they are a series of paper thin musical toys, including guitars, microphones, drum kits and amplifiers. They literally have no physical buttons or keys. The Light Strike guns are also very thin and they do look a bit like they’re made with paper. Love it or hate it, we kinda love it. Just like the Paper Jamz instruments, the Assault Striker doesn’t have any buttons to press. Instead it has touch-sensitive buttons, similar to a smartphone. The only push-button is the actual power button on top of the gun. Light Strike allows you to play in 4 teams with 4 different colours: red, blue, yellow and green. Simply hold the team button pressed and the gun will go through each of these colors. Friendly fire doesn’t exist so you don’t have to worry about shooting your team mates. You can have a maximum of 4 teams with an unlimited number of players per team. Just as you need to select the team, you will also need to select the weapon type you want to use during the laser tag battle. You can choose from 6 different types of weapons. Simply press the weapon select button and a cool voice will go through the available weapon options for you. The weapons increase in power as you go though the list. You may think that a more powerful weapon gives you an advantage, but the drawback is that the firing rate decreases as your power increases. This makes choosing the right type of weapon a bit of a strategic decision, which is very cool. The Striker will also tell you when you’ve run out of ammo. When that happens, simply hit the bottom of the Striker to reload and you’re good to go. The Assault Strikers come with standard simple targets. Simply power them up and start shooting at them. With each hit, the target flashes in the color of your team. This is great because you can clearly see who has scored a point. You can also purchase targets as accessories – see further below – but you can have just as much fun with the Assault Striker with simple target as it is. Both the Striker and the Assault Striker are designed to be customized. There are lots of attachments available that can improve the look and the features of your Light Strike gun. The Light Strike Scope is an attachment that doubles your range (up to 100″ or 30 meters) and also comes with a targeting system that gives you better accuracy. The Enemy Scanner is another cool add-on that helps you detect your enemies within a range of 20″ to 30″ (7 to 10 meters). The advertised range is 200ft which perhaps sounds too good to be true. We’ve tried this outside but we definitely couldn’t hit targets that far. 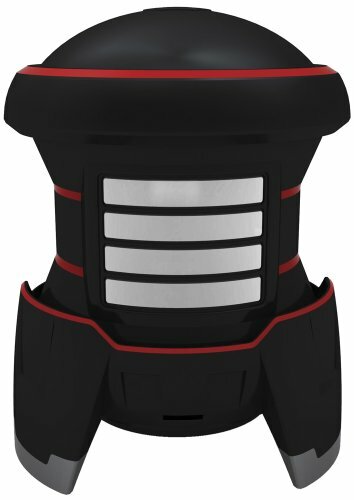 The Light Strike target vest, with shoulder sensor and target dome on the chest, works with both the Striker and the Assault Striker. 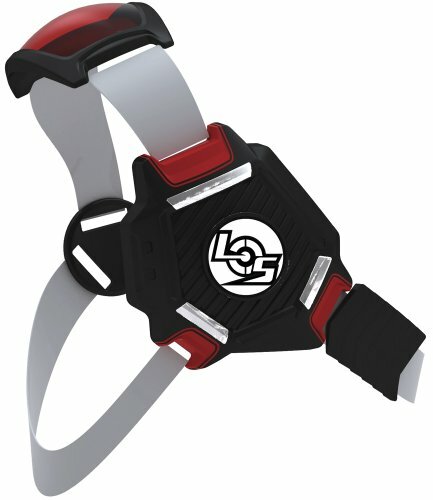 This adjustable harness vest allows you to activate a shield to protect yourself from enemies. Your team mates also have the ability to activate your shield when they think you need some cover. It also boasts a health meter to indicate how much life you have remaining, and you also have the power to revive team mates. The target vest can be a fun accessory but because the strikers have simple targets already, these vests don’t really add so much value. It should also be pointed out that the vests are a bit tight and not really suitable for adults. Just like the target vest above, the ITS works with both the striker and the assault striker. The ITS however, can be placed on the floor, so no need to carry anything around with you, apart from the gun itself. What’s cool is that it rotates during play to make the game a bit more challenging. The ITS also has different inbuilt games and 2 playing modes: Sentry mode (scans for enemies and blasts them), and Medic mode (regenerates health). While we think that the target vest is bit redundant, we do think that ITS has some great features that add another dimension to the game. 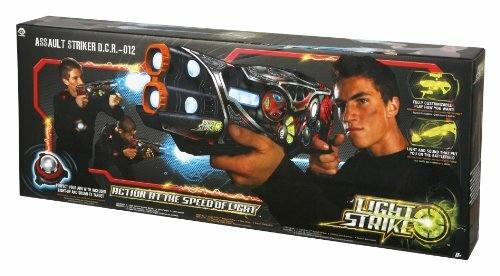 The WowWee Light Strike Laser Tag Assault Striker has been around since 2011 and has been a successful toy ever since. You can now easily find them on Amazon or eBay, and you can most likely find them at online second-hand markets too. The classic Paper Jamz style design is very unique in the world of home laser tag. Some will love it, others will say they prefer to have something more solid in their hands. We had to get used to it but we do actually appreciate it. This design aspect doesn’t really impact the quality of the game at all, it’s just a matter of personal preference. A drawback is that they can’t count the hits which makes it harder to actually play a competitive game. Apart from that, the guns are very decent and robust with great sound and light effects. The different team modes and available weapon styles are also awesome. The accessories are a bit unnecessary in our opinion (except for the ITS perhaps), but they are inexpensive and won’t break the budget.